Stay tuned for upcoming events for Aima Baig in near future. 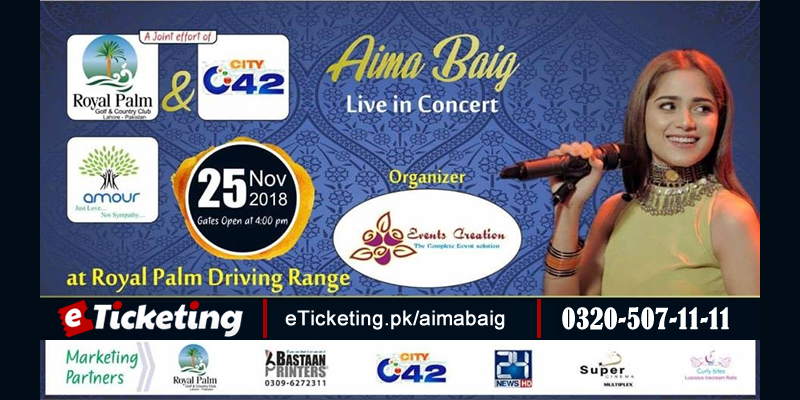 Live concert of Aima Baig at royal palm country club on Sunday 25th of November. Gates will open at 4 pm at Royal palm driving range. There will be a lot of entertainment, food stalls and art exhibitions. Event Organizing Company in Lahore. Terms & Conditions : All Rights are Reserved by the Organizer. Best Viewed at 1024 x 768 pixels and above. This Page loaded in 0.0235 seconds on Tue, Apr 23, 2019 (21:02).